What we like to call a surprise of the festival. Not exactly one of those bands you were going crazy about seeing but rocked you out none the less. A few festival goers gave them “Next Big Thing” tag. I’m not sure why the people at C3 didn’t think of this one earlier. The new cloth wristbands provided more comfort and look a lot nicer in your ACL scrapbook. I know ACL tends to score a lot of Austin bands, but this year seemed to mix some of the already established acts with some of the newer up and comers. 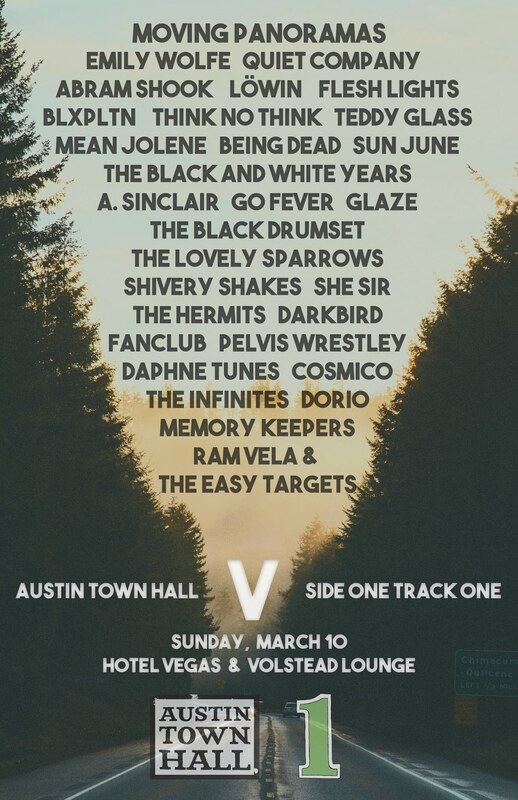 Octopus Project, The Black and White Years, Okkervil River, White Denim and a few others really showed that Austin is still the reigning live music capitol of the world. Count me in as one of the doubters about this band’s ability to translate their sound to the live setting. You can also count me in as one of the many who had their face shredded by CSS. The overal energy and desire of the Brazlian wonders rivaled even the biggest names at ACL. We can’t say enough about this band. We did a preview of them during the week leading up to ACL and boy did they deliver. Not many people around for the set…. boy did you miss out. We also did a preview on Jenny and she also failed to disapoint. Her backing band brings out the jams while she struts her stuff out front. She may not be considered the best singer around, but I dare you to find a better leading lady…. I dare you. Whether it be glowsticks at Beck or roses at Stars, objects flying in the crowd keeps things interesting in a really simple way. When you think the crowd is getting bored, throw some water on ’em or throw that broken guitar pick into the crowd. Yes, we close our top ten with something sappy… but honestly, what feeling could be better? You’re lost, you’re getting text messages delayed by an hour, you’re tired as hell and then…. you see that familiar face you’ve been looking for and all seems right in the world. Even the greatest band can’t recreate that feeling of tranquility when you find your amigos after a day of wandering around by yourself. What did we miss? What band should’ve made the list or shouldn’t be on the list? We couldn’t possibly agree on everything so let us know what you think of our ACL Top 10. 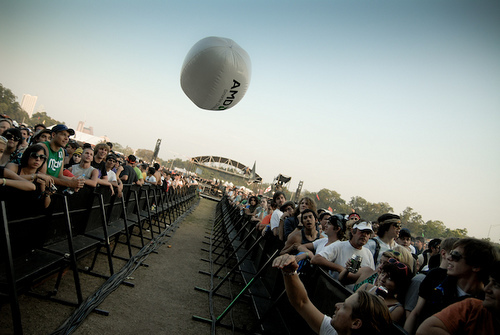 Tomorrow we bring you the 5 worst moments at ACL and a couple interviews. Oh no! Our picture in the post features The Black and White Years out of Austin, TX. Thanks for the hospitality gents. All other pictures are used with permission from photographer Eric Uhlir. We also appreciate his willingness to let us use some of his amazing shots. He has many more on his Flickr page. We recommend checking them out. My top moment was the Eric Uhlir photos…that guy is a big deal. 1. 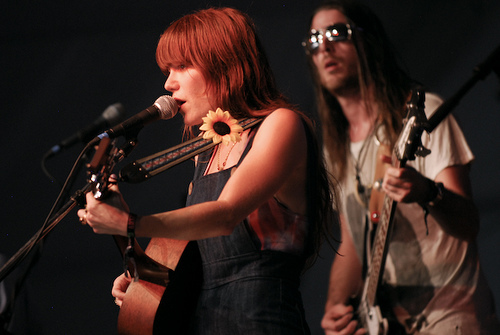 Meeting Jenny Lewis: I hooked up with the folks at KUT and got invited to her on-air performance in Studio 1A. She, Farmer Dave, and Jonathan Rice are SUPER nice in addition to being fantastic musicians. 2. Gogol Bordello: I stress fractured my foot jumping around at this sho when they came to Emo’s. Once again Eugene and his band of Eastern European Gypsy Punks did not disappoint. 3. Stars: Torquill and Millan always deliver the goods and this set was no exception. The best moment for me as a photog was their new guitarist climbing down into the photo pit to let the front row play his guitar. 4. Spiritulized: Backlit by the sunset on the Dell stage they were a band I’d never paid much attention to. Beautiful, monumental set. 5. 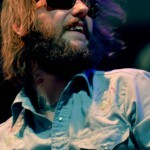 Band of Horses: I met Kyle, the photo editor of Brooklyn Vegan during the fest and we hung out a lot. He was on a plane with the band’s lead and once again, nicest guy. You could tell this set was a big deal for them, the culmination of a really great year for a great band. 6. Silversun Pickups: I rode the backstage shuttle with some fest worker and snuck up onto the wings shadowing her and the band’s manager and just started shooting. 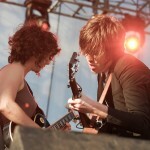 I photographed them a year ago ont eh inside stage at Emo’s and now they’re playing the AT&T stage at ACL. You could tell their minds were blown. 8. Del the Funky Homosapien: Finally, some decent hip hop at ACL. Event he photographers were bobbing their heads to this. Really tight. 9. The people: I met so many great people this year; fellow photographers, journalists, organizers, bands and the people in the front rows I talked to waiting for shows to begin. 10. The WORST thing: Dust. I got a terrible sinus infection. 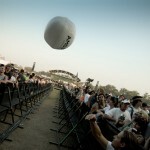 Seriously ACL, you’re the only fest with this problem from what I’ve heard. Figure it out and GET. ‘ER. DONE. See.. I told ya we missed some stuff. Stars was really really good, as was Gogol and Band of Horses. Not sure I was sold on the Del show though. And The Dust will def be in our top five worst things about ACL. ACL Fest is paying to have the whole park re-sodded after the trail of lights. As well as paying to have a new sprinker system installed. This should solve all dust problems. Bravo to ACL on that one. I will admit I’m a huge Del fan. And it was one of my favorite acts that day. It doesn’t get much better than 93 Til Infinity on the big stage. He played some old stuff from “I Wish My Brother George Was Here”, some Deltron 3030 and some Souls. I liked it. Delta Spirit came in 2nd for me; they really know how to play to a crowd. I think there’s something to say for a band that can wail on a trashcan lid and turn the crowd wild. The Swell Season’s soothing love songs pulled the day together for me. Despite their technical difficulties, at which point Glen Hansard got rowdy with a Van Morrison song, they maintained a good set and put me in the right mood to catch Manu Chao. This was the point where I constantly found myself torn and pulled in different directions as ACL decided to repeatedly match up 2 great acts against each other for the remainder of the weekend. 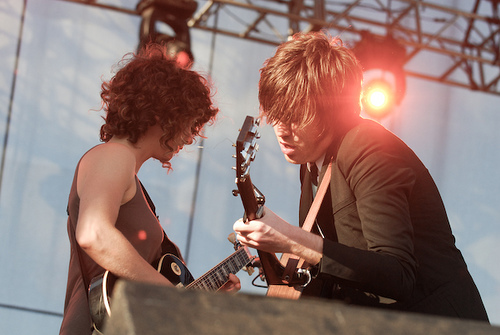 My favorite performance of the day was MGMT, I’m still bobbing my head to their electric rock grooves. They were a great live act and I would definitely like to see them again. Although I don’t regret my decision, I did miss out on Spiritualized which is a disappointment on ACL planning techniques. One of my disappointments of the day was missing CSS; I was able to catch the end after leaving Man Man early and immediately wished I would have caught the whole show as I heard their danceable poppy sound. They were loving the crowd’s enthusiasm as well and as they closed their set they shouted out their praises to the crowd and seemed genuinely happy to end their tour performing for the music lovers of Austin. Another pleasant surprise of the day: the energetic Sharon Jones and the Dap-Kings, for such a small lady, she is quite a presence. Her soulful vocals and equally impressive band really delivered a powerful punch of a show –she even taught a very ballsy audience member to “grind” on stage with her. 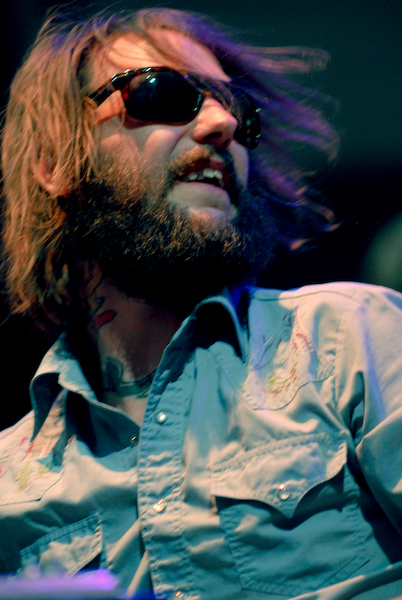 Band of Horses topped my list, possibly for the entire weekend. They were feeding off the crowd’s enthusiasm and singing praises to their favorite acts of the weekend and to all the ACL goers. We, in turn, were feeding off their ethereal tunes and Ben Bidwell’s rich, resonant voice. It was a true testament to their remarkable performance that the crowd remained through the end, even while the Foo Fighters began their set on the all-powerful and overpowering AT&T stage right next door.